The first printed Commencement programs, preserved in the University Archives, were simple folded sheets of paper. As late as the 1950s, programs were black ink on white paper, with no embellishments except the University Seal. In 1958, the first color cover appeared on a Commencement program. 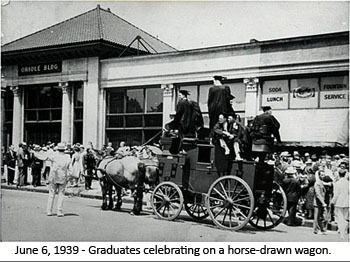 While the first four Commencement ceremonies (1884-1887) were held on Hopkins’ original campus (in the vicinity of Howard and Monument streets), the event quickly grew too large. So, for most years from 1888 through 1943, Commencement ceremonies were held off-campus, in area churches, the Academy of Music, and the Lyric Theater. 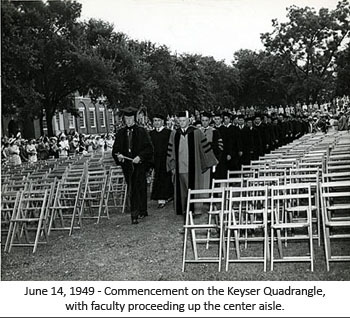 In 1944, due to the ongoing world war, Commencement was held on July 3, but this marks the first time that Commencement took place on the Homewood Campus, in front of Gilman Hall, using the steps and terrace as a stage. For many years, this event took place open to the elements, but in the 1970s, the University began erecting a tent, covering most of the quad, and this practice continued through 2000. Due to a major landscaping project that began in summer 2000, a tent was no longer feasible, due to irrigation pipes. It was decided to move Commencement to Homewood Field in 2001. Many graduates have fond memories of attending Commencement among the academic buildings, but the seating at Homewood Field accommodates more people and gives a better field of view to those watching their friends and family graduate.